With wage and economic growth at historic highs, and the unemployment rates among all major demographics at or near record lows, Americans have much to be thankful for this Thanksgiving. Turkey and stuffing with family and friends taste better when enjoyed with today’s job security, economic opportunity, and rising standards of living that are partially a result of the pro-growth policies enacted over the past two years. Unfortunately, this prosperity is threatened by the new Democratic House majority, whose policy priorities feature new regulations, higher taxes and reduced access to credit. 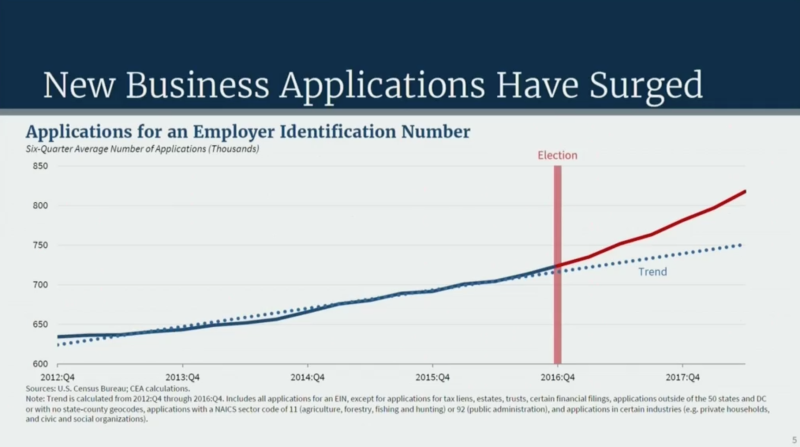 Chief in Democrat policy crosshairs are small businesses, which create two-thirds of new jobs, and have seen a resurgence under President Trump Donald John TrumpImpeachment? Not so fast without missing element of criminal intent Feds say marijuana ties could prevent immigrants from getting US citizenship Trump approval drops to 2019 low after Mueller report's release: poll MORE, reinvigorating Main Streets in the process. Take one of the top priorities of House Democrats: passing a national $15 minimum wage. The presumptive incoming speaker, Nancy Pelosi Nancy Patricia D'Alesandro PelosiImpeachment? Not so fast without missing element of criminal intent 20 years after Columbine, Dems bullish on gun reform Hillicon Valley: House Dems subpoena full Mueller report | DOJ pushes back at 'premature' subpoena | Dems reject offer to view report with fewer redactions | Trump camp runs Facebook ads about Mueller report | Uber gets B for self-driving cars MORE, has vowed to pass this wage floor in the first 100 hours of the new Congress. The fact that the shopworn, discredited idea of wage controls is on the front page of the Democratic policy playbook demonstrates the intellectual bankruptcy of their agenda. A $15 minimum wage would dramatically increase labor costs for small businesses and swamp the tiny profit margins on which most operate. Given that this proposed minimum wage increase is so big — more than double the current federal minimum wage — it’s likely that the majority of small businesses in the country would be negatively affected. And despite what the media say, employee prospects rise and fall with small businesses. Even in wealthy Seattle, which passed a $15 minimum wage in 2014, independent researchers at the University of Washington revealed that entry-level jobs and hours worked fell as a direct consequence. As a result of reduced hours, entry-level wages actually fell by $1,500 a year, on average. A minimum wage increase that reduces wages? Just more proof that you can’t fight economics. If the $15 fallout was this bad in Seattle, think of the consequences to Main Street and entry-level employees in poorer cities such as Shreveport, Sioux Falls and South Bend. Of course, even economic realists recognize the hardships of living on minimum wage and want employees to earn far above it. But rather than trying to achieve this goal through a counterproductive and controversial $15 minimum wage, Democrats and Republicans should come together to advance the bipartisan cause of a fight for $50 — as in a fight for $50,000 annual salaries — the level at which Americans can solidly enter the middle class and begin to live the American Dream. Sound far-fetched? More like farsighted. There are 7 million unfilled jobs in the country, roughly half of which pay $50,000 a year or more, according to the Labor Department. Young and less-skilled workers should aspire to fill these positions, not hold out hope that their wages will be artificially raised by fiat. The open jobs aren’t all for computer programmers or engineers. In fact, the bulk are for semi-skilled positions in manufacturing, trades and health care. It’s true that to land these positions, applicants require some skills. But these mostly can be acquired by completing one- or two-year certification or apprenticeship programs. In other words, they don’t require a four-year college degree (or its associated student debt load). Employees also learn the skills necessary to get a $50,000 a year job in their entry-level jobs, which often are on the chopping block in $15 minimum wage environments. Preserving these first jobs — the first rung on the career ladder — is an integral part of the fight for $50. And just last week, Rep. Maxine Waters Maxine Moore WatersOn The Money: House Dem says marijuana banking bill will get vote in spring | Buttigieg joins striking Stop & Shop workers | US home construction slips in March | Uber gets B investment for self-driving cars Democrats should be careful wielding more investigations Dem House chairs: Mueller report 'does not exonerate the president' MORE (D-Calif.), the presumptive incoming House Financial Services Committee chair, implied that there would be no further reforms to increase access to credit — the lifeblood of small businesses. The Job Creators Network is putting House Democrats on notice that such policy proposals that threaten the small business, economic and labor market success of the past two years will be exposed to their constituents. Only by fighting for small businesses can we ensure that the economic climate of this Thanksgiving has many happy returns.